Citation: C N Trueman "Kamikazes and World War Two"
historylearningsite.co.uk. The History Learning Site, 19 May 2015. 5 Apr 2019. Kamikazes and the creed that went with the kamikazes in World War Two is usually associated with those Japanese pilots who flew into American warships in an effort to sink them. However, there were other forms of kamikazes such as the human torpedoes that the Japanese used in the Pacific. ‘Kamikaze’ means ‘divine wind’ and those men from Japan’s 205th Air Group – the kamikaze unit – inflicted serious losses on the American Pacific fleet, especially at Okinawa. 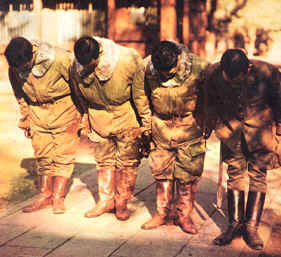 It is generally thought that those men who volunteered to join the 205th Air Group were given a guarantee of a place in heaven for sacrificing their life for the emperor. Survivors from the 205th give another reason. Many young men volunteered to join. The only son from a family was theoretically barred from joining the 205th but appeals from families usually allowed an only son to join. At the end of World War Two, American Intelligence interviewed those who had joined the 205th and had survived – probably because their ‘turn’ had not yet arrived for a plane or attack. In these interviews it became clear that sacrificing your life for your country was perfectly acceptable in a Japan that had been dominated by the military for years. The probability of a kamikaze actually getting through to a target was limited due to the vast gun power the American Navy had at its disposal. At Okinawa in 1945, out of 193 kamikaze attacks, 169 planes were destroyed. In fact, at Okinawa, the kamikazes did a great deal of damage – 21 ships sunk and 66 damaged. However, this damage would have been much greater if more planes had actually got through to a target.